(Bloomberg) -- As hundreds of thousands of his citizens took to the street demanding his departure, governments everywhere called on the president to step down. Neighboring states absorbed those who fled, creating a refugee crisis. Its oil was embargoed, its embrace of socialism derided. "This regime is the equivalent of a dead man walking," a top U.S. official told Congress. No, Syria in 2011, when you had to look pretty hard for an analyst or Western official who believed President Bashar al-Assad could survive the combined assault of domestic revolt and international boycott. Although the U.S. recognized the Syrian opposition as the legitimate representatives of the nation, Assad remains in the presidential palace in Damascus, stronger than ever. Eight years ago, few predicted that. Even Israel's leaders -- who viewed Assad as "the devil we know" (better than Islamists or chaos) and were skeptical about that year's Arab spring uprisings -- said he was a goner. Defense Minister Ehud Barak said the Syrian president might last "many weeks, but it's not a matter of months or years." That sums up conventional wisdom today about President Nicolas Maduro of Venezuela. He was reelected last year but in a rigged process with almost no one opposing him and voters afraid and hungry. In the past month, National Assembly leader Juan Guaido has emerged to challenge him; the Western world has rallied behind Guaido as the country's legitimate head of government. And while the odds remain high that Maduro will be driven out -- perhaps even quickly -- the parallels with Assad and Syria are worth pondering as a cautionary tale. The pressure on Maduro goes beyond diplomatic jostling. The U.S. has ended its purchase of Venezuelan oil, the government's biggest source of revenue. Some 3 million Venezuelans have fled, creating a refugee crisis for its neighbors, especially Colombia and Brazil. Massive street demonstrations have presented a steady picture of citizen rage. The only significant country pledging backing for the regime is Russia. As with Assad eight years ago, it's hard to find an analyst or Western official predicting Maduro's long-term survival. The parallels are striking, including the way the Syrian revolt of 2011 and the anti-Maduro moves of recent weeks fit into significant historical trends. Assad's authoritarian rule was challenged within weeks of the forced departures of two long-time Arab dictators pushed out by street protests -- Zine El Abidine Ben Ali of Tunisia and Hosni Mubarak of Egypt. Libya's Muammar Gaddafi wasn't far behind. That led analysts to assume Assad was next. In Latin America, a slew of leftist populist governments like Venezuela's has been rapidly replaced through elections by pro-market conservatives. These include Brazil, Peru, Chile and Argentina. 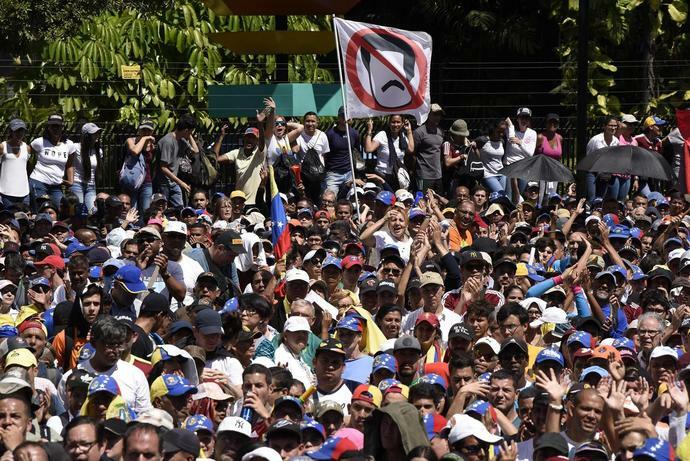 How can a holdout like Maduro survive? Most analysts still say he can't. The differences between Maduro's and Assad's situations are more important than the similarities, Miller said, making it hard to see Maduro surviving in power. Unlike Syria, the Venezuelan state relies for income almost exclusively on oil sales, especially to the U.S., and Washington's recently announced boycott could prove crippling. Second, the loyalty of the security establishment in Syria is based on membership in the Alawite minority of the Assad family, whereas in Venezuela it's more transactional; peeling away top generals in Caracas will prove easier. Finally, the Syrian opposition is divided by tribe, ethnicity and religion with no clear leadership; in Venezuela, the opposition is famously splintered but along political lines. In the past month it has lined up behind Guaido. In Syria, many have been more afraid of the opposition, much of it Islamist, than of Assad, said Vali Nasr, dean of the School of Advanced International Studies at John Hopkins University. Venezuela looks more like Egypt in 2011 than Syria, he said. Dany Bahar, a Venezuelan political scientist at the Brookings Institution in Washington, said the economics of Venezuela will likely prove fatal to Maduro. "He can't stabilize the economy, it's going to get worse and worse," Bahar said. "Half a million barrels of oil exported to the U.S. is the only cash-generating exports he has." On the other hand, the pro-Maduro camp has sent signals that military officers who defect will be exposed as corrupt. That's what happened when Francisco Yanez, an air force general, announced his support for Guaido -- so far the only general to do so publicly. The commander of the air force promptly tweeted about Yanez's alleged corruption, promising further details. That could slow defections. The evolution of the conflict will also be important. Within a year of the Syrian uprising, it turned into a civil war involving deep tribal and religious divisions. Such ethnic splits don't exist in Venezuela, a homogeneous society of 30 million. But if parts of the military back Guaido while others back Maduro, a civil war could erupt. Then the echoes of Syria could grow louder.